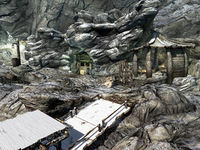 Gloombound Mine is a large ebony ore mine southeast of Windhelm, within the Orc stronghold of Narzulbur, that also contains some iron ore veins. It is owned and worked by Orcs from the Orc stronghold of Narzulbur with help from hired workers from the Largashbur Orc Stronghold. * These Orcs have been hired from the Largashbur Orc stronghold due to a deficit of workers in Narzulbur. 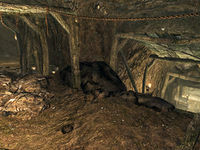 As you head towards the mine, you will pass over a bridge from the compound in Narzulbur. On the far side is a cart containing a piece of owned ebony ore. 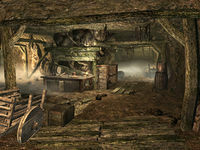 Complete blacksmith facilities including a smelter, a forge, a grindstone, and a workbench are located under a covered work area beneath the mine, along with a table and chair. There is an ebony ingot and an ebony ore (both owned) on the workbench. Behind the forge are two buckets, one of which contains a piece of unowned ebony ore. The path to the left of the smelter leads up to the mine, passing an orichalcum ore vein on the left. Just past the entrance is an immobile cart containing three pieces of owned ebony ore. Beyond this is a shack that has a copy of the Smithing skill book Heavy Armor Forging on top of a table, an unowned single bed with an apprentice locked chest underneath and a baked potato cooking next to a fire at the rear. Unless you are Blood-Kin or win a brawl with Chief Mauhulakh before entering the mine, the miners will continually berate you and tell you that you are not supposed to be here. 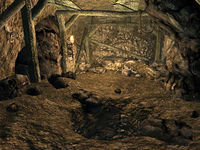 The mine is the richest source of ebony in Skyrim. On a single trip to the mine, it is possible to obtain 65 pieces of ebony ore, which can be smelted to 32 ingots (or 48 and 24 respectively if you are not willing to steal). Dushnamub in the stronghold will buy ebony ore from you. Care must be taken as there are several pockets of flammable gas within the mine, so any naked flame can cause an explosive fire. There are numerous pickaxes found throughout the mine. Upon entering the mine, there is a snowberry bush on your left and a ramp leading down to a crossroads; a helmet and a woodcutter's axe can be found on a table to the left. Turn left (north) past the table to reach two ebony ore veins—one on the right wall, and the other on the ground—as well as an iron ore vein on the ground. At the end of the tunnel, on the end wall, is another ebony ore vein. Turning right (south) at the crossroads will land you at a dead end with an ebony ore vein. Straight ahead (east) at the crossroads; you will pass a shelf on your left with an iron helmet and a medium coin purse, as well as an iron ore vein on the ground in front of it. Follow the tunnel up the ramp and you will find an iron ore vein on the ground on the left. At the top of the ramp, if you turn left, you will encounter a dead end with two ebony ore veins, one on the left wall, the other on the right. Turning around past the top of the ramp, an ebony ore vein is on the ground on the right. Continue straight ahead past an oil slick to reach a tunnel on your right, where there is an iron ore vein on the ground. Just after this vein, on the left, is a barrel with an iron dagger and a garnet on top of it. Two ebony ore veins are at the end of the tunnel, both on the ground. Back to the turn, now on your left (west) are two upright barrels, one of which has a piece of ebony ore lying on top. The turn takes you through a braced section of tunnel with a dogleg. Partway through are two iron ore veins, both on your right. Further along the tunnel as it turns to the right is an ebony ore vein. Next to this vein is a cart which contains three pieces of ebony ore. Just past this is another vein on the right hand wall. Be careful between this ore vein and the end of the tunnel as there is a loose segment of planks in the middle of the ground, which will crumble and drop you down to the crossroads by the entrance if you step on it. Between the planking and the end of the tunnel is a bucket containing two pieces of ebony ore. At the end of the tunnel, five ebony ore veins can be found: two on the ground, and one on each of the three walls at the end of the tunnel. It is possible that one of the Orc workers will trigger the rotten planks and fall to his or her death. This page was last modified on 24 March 2017, at 23:24.